There will soon be cities all over the upper midwest vying with Chicago for the nickname "windy." Jurisdiction must be clearly delineated between 8 states and 2 Canadian provinces. Environmentalists must sign on to any plan because bird migration corridors and fish spawning sites are at stake. The business community must be on board because shipping lanes and energy supplies will be affected. The U.S. Army Corps of Engineers might be required to cope with unique challenges like the winter ice cover. Legislation may be necessary to establish where turbines are legal and what the fair market value is for turning public resources held in trust for all the citizens of the region into energy assets. Jennifer Nalbone, navigation and invasive species director, Great Lakes United: "This is our last frontier, our wild west…Renewable energy is the direction we want to go, but you don't want to enter it blindly." The wind energy industry's habit has long been to keep its siting procedures and development policy practices as clean as the energy it generates. By all reports, it is laying the groundwork to do so once again in the Great Lakes region. Wind developers are ambitiously studying the Great Lakes region for its offshore wind potential. In response, state and federal officials have begun to write rules and environmentalists are watching closely. - October 27 to 29: Updates were reported at the International Submerged Lands Management Conference. - Now: The U.S. has no offshore installations but projects are in planning stages for the Delaware, New Jersey and Rhode Island. - Soon? A feasibility study is being done for Lake Erie, near Cleveland. 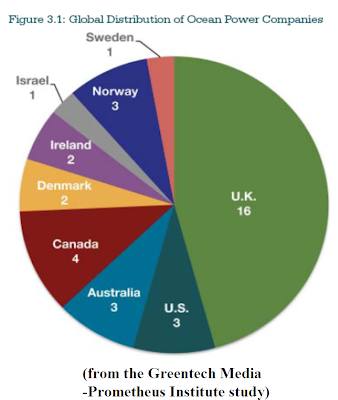 - Denmark, Sweden, the United Kingdom, the Netherlands and Ireland have offshore installations. - Germany has 20+ offshort projects in development. - Denmark's largest offshore installation is 80 turbines 8-to-12 miles off its coast. - Installations on the Great Lakes would have implications for commercial and recreational navigation, water quality, fish habitat and flight patterns of birds and aircraft. 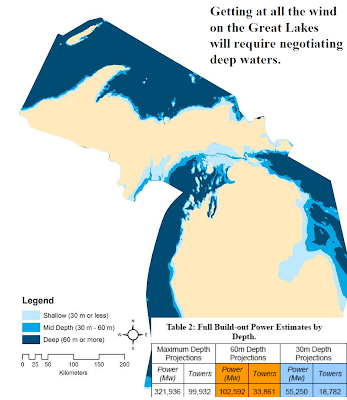 - From a Michigan State University study: Michigan's portion of the Great Lakes could produce ~322,000 megawatts of windpower (w/ nearly 100,000 turbines), which is ~1/3 U.S. electricity. 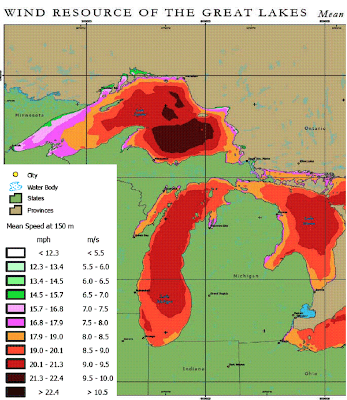 - Producers and planners are urging the Great Lakes states to designate acceptable sites and sites for shipping lanes, bird migration corridors and fish spawning that wouild be off-limits to turbines. Michigan's Institute for Fisheries Research is working to identify such locations. - John Cherry, University of Michigan researcher, Great Lakes Commission: "It's an unknown, so there's a huge amount of risk…Everybody would like to be the second program to do it. The first will be a regulatory trailblazer." - Laurie Jodziewicz, siting policy manager, AWEA: "There is interest in the Great Lakes, and I know some companies are looking there…"
- Tom Graf, Land and Water Management Division, Michigan Department of Environmental Quality: "We may find we don't have the authority to address a lot of these issues…"
- Chris Shafer, professor, Thomas M. Cooley School of Law: "It's entirely too easy to consider that a free resource that should be provided to the energy industry…"
A British journalist has a point to make. Yet coal industry advocates continue to dangle the seductive promise of “clean” coal in their bids for the permitting of new plants. Politicians from here to down under seem to desperately want to believe in it. Both John McCain and Barack Obama, Austalia’s progressive Prime Minister Kevin Rudd, German Chancellor Angela Merkel (who as a scientist should know better) and former UK business secretary John Hutton have all recently made promising references to “clean” coal. The EU is planning to spend billions on pilot projects. They are all clinging to the simplest math: Global climate change aggravated by coal-fired power plants PLUS (1) cheap, (2) abundant coal PLUS (3) the scientific concept of capturing coal plant emissions and burying them EQUALS (4) cheap, abundant, clean energy. Former British chief scientist Sir David King: "[It is] the only hope for mankind". (1) There is no cheap coal: The cost of new wind installations rivals the cost of new coal plants. Where wind is most abundant, the long-term financing cost of coal plants makes them more expensive. When the excessive cost of installing “clean” coal technology is factored in – if such technology is ever developed at commercial scale – it will make such plants prohibitively expensive. (3) Coal plant emissions-capture-and-storage (CCS) does not exist at commercial scale. It is only a concept. There is at present the ability to capture SOME greenhouse gas emissions and other toxins and bury them with SOME safety in deep sea geologic cavities or old oil formations. The actual product of burning coal is not energy, that’s a byproduct. The actual product is carbon dioxide (CO2). The point: Using coal to generate electricity inevitably creates A LOT of CO2 emissions. The cost of equipping coal plants to capture large quantities of emissions is so great it has prevented CCS systems from being built. There is no proven, long-term, safe storage and the cost of insuring trial sites - because the risk of failure is so high - has prevented almost all the storage sites that have been planned from being built. Finally, mathematician Vaclav Smil calculates it would take a transport and pipeline infrastructure equal to the one now used to move all the world’s oil and gas supplies to facilitate the sequestration of the world’s coal plant greenhouse gas emissions. Building such infrastructure would take a very long time and be very expensive. (4) Cheap, abundant, clean energy is available NOW from wind and solar and it will soon be available from hydrokinetic (ocean, wave, tide) energies. Expanding the infrastructure for such cheap, abundant, clean energy will, as a bonus, facilitate the transition away from fossil fuel-powered personal transport to electric vehicles, eliminating another source of climate change-inducing greenhouse gases. Old Energy advocates frequently repeat the canard that New Energy is not available in adequate quantity. True - because Old Energy advocates for 3 decades obstrcuted the building of it. 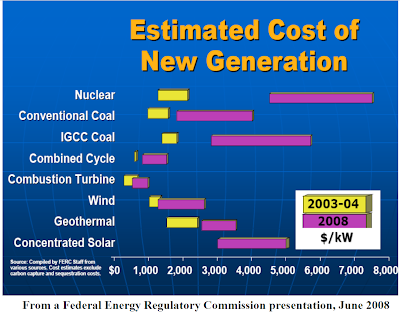 Give New Energy a level playing field and 10 years and then do the math again. Why are so many people so completely wrong? The coal industry has had centuries to instill its propaganda. And it is not slowing down its efforts. 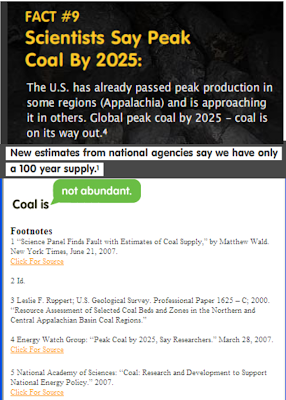 The American Coalition for Clean Coal Electricity (ACCCE), a coalition of US coal mining companies and electricity utilities, continues to spend tens of millions of dollars to promote "clean" coal through advertising and insidious promotional activity. Because there is no such thing as “clean” coal and no real hope of it in the foreseeable future, activists want coal plant builders to disclose to their investors and financers the truth about the harm using coal as an energy source to create electricity does to the environment and the extent to which it aggravates global climate change. New York Attorney General Andrew Cuomo recently announced he had convinced coal power Dynegy to join Xcel Energy in committing to make such a disclosure. AES Corp., Dominion Resources Inc., and Peabody Energy Corp. remain in Cuomo’s sites. Much welcomed and heralded, this news is both less and more significant than the news stories make it out to be. It is less significant than the news stories make it out to be because the companies have done nothing more than agree to a standard Securities and Exchange Commission (SEC) declaration. The lawyers at Dynegy and Xcel obviously decided including such disclosures protects them more than not disclosing. The disclosure portends no change in practices. It is rather like a doctor obtaining an informed consent. Few patients refuse when they are given no other option. The announcement is also more significant than the news stories make it out to be because it indicates the Dynegy lawyers have decided it is necessary and it is to be expected that other coal companies’ lawyers will come to the same conclusion. Ceres, a coalition of responsible investors and public interest groups, says disclosure could turn money toward New Energy. Once the risks become necessary to widely disclose, it may become obvious there are less risky sources of energy. Disclosure of harm is the first step. Full disclosure, that there is no such thing as “clean” coal, is the big step. - Dynegy has agreed to put detailed information in its financial filings on any material business risks posed by climate change. - Coal industry advocates offer the promise of “clean” coal in a bait-and-switch bid for permits to build new plants. - From the Massachusetts Institute of Technology’s The Future of Coal: The first commercial-scale carbon capture and storage (CCS) plant won't come online before 2030. - Edison Electric Institute testimony to a House of Representatives committee: commercial deployment of CCS will require 25 years research. - December 2007: Cancellation by the U.S. Dept. of Energy of the biggest CCS R&D project in the world. - 2007: Cuomo subpoenaed 5 major energy companies: Xcel, Dynegy, AES Corp. (AES), Dominion Resources Inc. (D), and Peabody Energy Corp. under New York's Martin Act. (3 to go). - There is a war against coal going on in Europe, Australia and the U.S.
- A Google search will turn up 1 million+ web pages about “clean” coal. 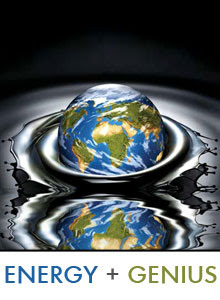 - Australian Prime Minister Rudd sees "clean” coal as a way to both meet Australia's Kyoto protocol pledges and to assuage industry. - German Chancellor Merkel sees “clean” coal as a way to cut emissions without violating her country’s ban on nuclear energy. - U.S. presidential candidates Obama and McCain like “clean” coal as a way to make promises they don’t have to worry about keeping. - Dynegy is based in Houston and provides wholesale power in 13 states. - A current confrontation between environmentalists and German utility E.ON in the UK government over a new billion-pound "cleaner coal" power station – Britain's first coal plant for three decades – at Kingsnorth in Kent typifies the use of “clean” coal by the industry. Builders obtain construction permits with the promise to make plants “clean” coal-ready on the assumption the technology doesn’t exist and they will be able to carry on generating with dirty coal. - Disclosures may include warning investors about coming expensive requirements to limit emissions or pay for them or the possibility of law suits for health-affecting pollution. - Environmentalists applauded Cuomo’s deal with Dynegy. - CO2 emissions are higher from coal, per unit of energy generated, than any other fuel. - Many toxic elements are buried in coal. When coal is dug up and burned, the toxins are released into the earth, water and air. Click for more info on the National Day of Action. - Andrew Cuomo, attorney general, state of New York: "Today we raise the bar in the industry and ensure transparency and disclosure in the marketplace…Investors have the right to know all material financial risks faced by coal-fired power plants associated with global warming." 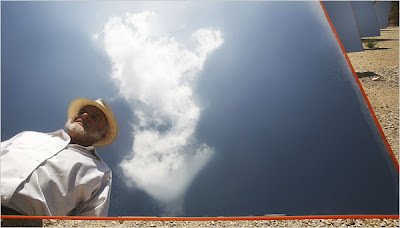 - Fred Pearce, Greenwash Column, UK Guardian: Just say no. SolarCity gets $30 million in funding from First Solar, other investors; The financing would help the installer of photovoltaic systems expand in the U.S. Under a five-year deal, First Solar will also supply solar panels. “…a glimpse at a critical part of New Jersey's energy future [is]… decades worth of household trash, construction waste and assorted refuse that is providing electricity to thousands of homes…21 landfills in New Jersey that convert methane gas produced by decomposing trash into electricity…The federal Environmental Protection Agency has targeted eight more potential sites as part of its Landfill Methane Outreach Program. Nationwide, the EPA counts 455 landfills that convert methane into energy. One of the state's leading environmentalists envisions landfills someday incorporating wind and solar power in concert with methane gas..."
According to Energy (R)evolution 2008, a new report from Greenpeace International and the European Renewable Energy Council (EREC), the citizens of the world can shift 100% to New Energy by 2090, have all the energy we want and profit from the change – IF we are willing to pay the price. That depends on how fast we want to get where we sooner or later must and will go. The report: "Especially in the context of today's economic instability, investing in renewable energy technologies is a 'win-win-win' scenario: a win for energy security, a win for the economy and a win for the climate…"
The next question: What about the developing world? 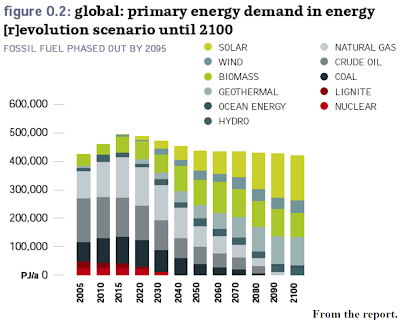 According to the report, the move to New Energy must begin in the developed world. When the technology is ready, the transition will be of such great benefit to the nations of the developing world, they will welcome it as an opportunity. G. Ananthapadmanabhan, programme director, Greenpeace International: "Countries like China and India are well placed to take the enormous investment opportunity presented by the energy revolution…The energy revolution is key to them climate-proofing their development." 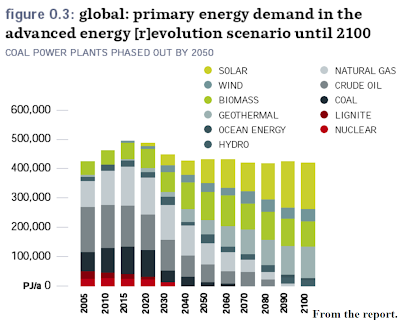 The report predicts the plan will, by mid-century, create a $360 billion (E285 billion) industry with the capacity to provide half of the world's power. The process will first bring greenhouse gas emissions to a peak in 2015 and then start cutting per capita emissions as well as future fuel costs. By 2050, it foresees $18 trillion in fuel cost savings with per capita emissions reduced from 4 tonnes/person to 1 tonne/person. The plan identifies 5 key principles that must guide the shift to New Energy: (1) New Energy and distributed solutions, (2) respect for the environment’s limits, (3) a phase-out of dirty, unsustainable Old Energy, (4) resource equity, and (5) decoupling of economic development and fossil fuel consumption. The EREC and Greenpeace believe the technology is ready. All that is lacking is the political commitment. Sven Teske, energy expert/report co-author, Greenpeace International: "Unlike other energy scenarios that promote energy futures at the cost of the climate, our energy revolution scenario shows how to save money and maintain global economic development without fuelling catastrophic climate change…All we need to kick start this plan is bold energy policy from world leaders." Energy (R)evolution 2008 is a "practical blueprint" to eliminate fossil fuel use through an investment in New Energy revolution that would stop global climate change and turn the global financial crisis around when the investment begins paying for itself through energy savings. - Through 2030: The crucial period of investment, requiring $14.7 trillion. - Eliminating coal by 2050: A more radical scenario, bigger investment in New Energy. - Eliminating fossil fuels by 2090: With trillions of dollars invested in New Energy, the global market could grow at double digit rates and be bigger than today's fossil fuel industry by mid-century. - The New Energy marketplace: Almost doubled from 2006 to 2007 ($70+ billion). - The New Energy marketplace: Could more than double to 30% of world energy by 2030 and get to 50% by 2050. - China, India and emerging economies: Access to energy can be maintained through the transition if established economies cut demand and emissions by transitioning to New Energy and energy efficiency. - The report was presented in Berlin. 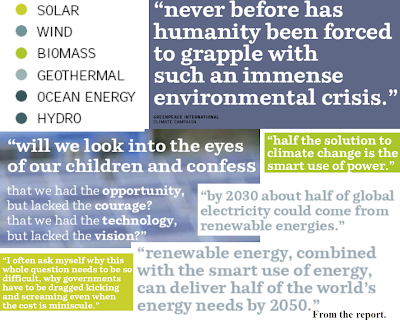 - The report sees the world entirely fueled by New Energy (solar, wind, hydrokinetic, biogas, etc.) by 2090. - The 210-page report’s publishing groups see climate change as the crucial factor driving the transition. - The report looks in detail at how energy use would have to be changed to meet the IPCC’s call for greenhouse gas emissions reductions. - The EREC/Greenpeace plan would cut emissions enough to prevent a temperature rise of 2 degrees Celsius (3.6 Fahrenheit) from the pre-Industrial Revolution norm. (4) Rigorous international efficiency standards for buildings and vehicles. - The International Energy Agency (IEA) foresees New Energy investments of just $11.3 trillion to 2030 and expects the world to remain dependent on fossil fuels and nuclear power through mid-century. - From the Report: "Renewable energy could provide all global energy needs by 2090…"
- Rajendra Pachauri, head, IPCC: "[The study is] comprehensive and rigorous…Even those who may not agree with the analysis presented would, perhaps, benefit from a deep study of the underlying assumptions…"
- Sven Teske, lead author, Greenpeace: "The current unstable market situation is a strong argument for our energy (r)evolution concept…We had a 'dot.com bubble' and a 'finance bubble' - but I'm confident that we will not have a renewables bubble - as the need for energy is real - and growing especially in developing nations…"
- Oliver Schaefer, Policy Director, EREC: "[R]enewable energies such as wind power at good sites are already competitive with conventional power. From around 2015 onwards, we are confident that renewable energies across all sectors will be the most cost effective…The renewable industry is ready and able to deliver the needed capacity to make the energy revolution a reality. There is no technical impediment but a political barrier to rebuild the global energy sector…"
Which came first, the chicken or the egg? That may not be the right question. Take hydrokinetic energy. Hydrokinetic energy, or energy derived from waves, tides and currents, has tremendous promise. 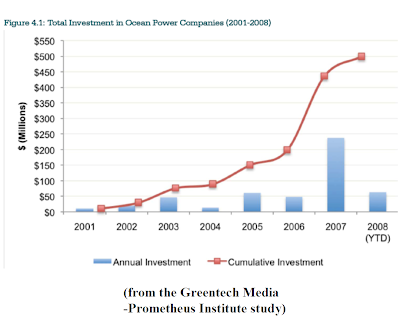 Forecasting the Future of Ocean Power, a recent study from Greentech Media and the Prometheus Institute reported hydrokinetics will see investment of $500+ million/year and grow from its current 10 megawatts of installed capacity to 1 gigawatt (1,000 megawatts) through 2015. An Emerging Renewables Resource Program (ERRP) proposal to fund two wave energy projects off the Mendocino County and Humboldt County coasts from major California utility Pacific Gas & Electric (PG&E) is currently awaiting approval from the California Public Utilities Commission (CPUC), the regulatory body that oversees the state’s public utilities. PG&E could be in for disappointment on that ERRP proposal, though, if CPUC’s most current decision on wave energy is any indication. CPUC just announced it is rejecting a proposed power purchase agreement (PPA) PG&E wanted to sign with wave energy producer Finavera Renewables. Despite the fact that Finavera is one of the most active wave energy developers in the world, CPUC says the technology is "nascent" and not “viable" and too expensive. Finavera says the move puts California in opposition to the federal government and other states that are writing regulations for hydrokinetic installations and preparing to open up leasing for commercial-scale pilot projects. PG&E responded to the CPUC rejection by declaring it will do serious harm to the development of hydrokinetic energy. One of the authors of the Greentech Media/Prometheus Institute study doesn’t think that’s right. 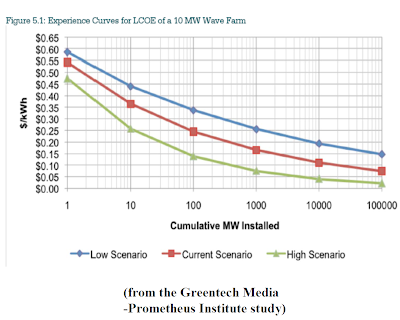 Daniel Englander, co-author, Greentech Media/Prometheus Institute report: "PG&E picked the wrong company…Finavera isn't a bad company, it's just that their technology isn't at a stage where it's ready to deliver power commercially." Englander predicts several companies will have production-ready ocean energy systems with 2-or-more-megawatts of capacity by 2013. In fact, as reported October 8 (see FIRST WAVE FARM IN THE WORLD…), Pelamis already has a 2-to-3 megawatt installation working off the coast of Portugal with plans to build a 25-megawatt expansion. Does that make CPUC wrong? Not exactly. The problem with the Pelamis installation, as detailed in the earlier NewEnergyNews report, is that the energy returned on energy invested (EROEI) is questionable. The problem may simply be, however, the absence of economies of scale – which will continue to be absent if decisions like this one from the CPUC stand. Neither. First came the government mandate, then the subsidy, then the poultry business. CPUC denied its approval on a power purchase agreement (PPA) between PG&E and Finavera for energy derived from waves. - A Finavera test buoy sank off the coast of Oregon in 2007 before a 6-week trial was complete. - The PPA was written to go into effect in 2012. - The wave installation was to be – or will be – 2 and 1/2 miles off the coast of Eureka in Northern California. - PG&E is based in San Francisco. - Finavera Renewables is based in Vancouver, British Columbia. - Finavera Renewables’ AquaBuoys float on the ocean surface, capture the wave’s force to turn a turbine that generates electricity which is sent by an undersea cable to a substation on shore. - CPUC said wave-energy technology is "in a nascent stage" and Finavera's buoy is "not currently viable." - Though the terms of the PPA were not disclosed, CPUC stated that it made the cost of power to PG&E too high. - CPUC is charged with overseeing oversees power purchases and rate adjustments by California public utilities. - PG&E says it will pursue other wave energy purchases. - PG&E believes the CPUC decision will drive hydrokinetic energy developers to other states. - Finavera will seek financing through a consortium of private investors as well as turn its efforts to the development of wind projects in Canada and Ireland. - Jennifer Zerwer, spokeswoman, PG&E: "We respectfully disagree with the decision…"
- Brian Cherry, vice president of regulatory relations, PG&E: "[This will have] a chilling effect on wave development in California." Who takes the heat for standing between Californians and the energy from their sunshine? 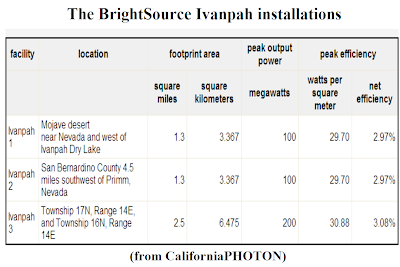 BrightSource Energy has applications pending for large solar power plant installations in California’s Mojave desert. The technology is ready. The financing is in place. The power is sold through a power purchase agreement (PPA) with Pacific Gas and Electric Corp. (PG&E), the state’s biggest utility. Only 1 thing is missing: Permission. The California Energy Commission (CEC) and the federal Bureau of Land Management (BLM) are working out the details of the permitting. They have been working out the details for some time and there is no sign of approval. BrightSource Energy says this interminable delay sends "a chilling signal to large-scale solar developers and their investors…[instead of] the right signal ... that California welcomes and supports [solar power plant projects]..."
Adding to the controversy, Robert F. Kennedy Jr. (an in-law to California Governor Arnold Schwarzenegger) and Terry Tamminen (Schwarzenegger’s former environmental secretary) are part of VantagePoint Venture Partners, a private investment group with a multimillion-dollar stake in the BrightSource installation. The “not-whatcha-know-but-whoya-know" folks don’t seem to be doing BrightSource much good despite the fact that the governator is maybe one of the biggest solar energy cheerleaders in the country. Schwarzenegger: "My vision is that when I fly up and down the state of California that I see everything blanketed, every available space blanketed, with solar - if it's parking lots, if it's on top of buildings, on top of prisons, universities, government buildings, hospitals…Solar, solar, solar, that is my goal…"
Schwarzenegger might be able to influence the CEC but nothing seems to be able to move the BLM, which must agree to lease its Mojave Desert land. Its review has generated thousands of pages of documents and studies on everything from possible erosion to impacts on a protected desert tortoise. Could it be the feds would rather see California remain reliant on natural gas instead of building solar power plants? Ausra, another innovative California solar power plant builder, made the strategic decision to develop purchased or leased private land. The result: It brought a 5-megawatt pilot facility online last week and is building a 177-megawatt plant that should be ready by Summer 2009. BrightSource wants a decision on its project by Summer 2009. Some observers say it could take until the following summer. The Brightsource Energy solar power plant technology. From 5293565 via YouTube. 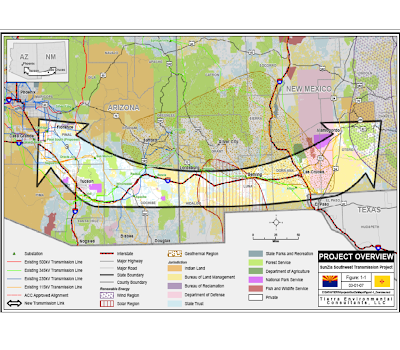 Brightsource Energy is pushing the CEC and the BLM to grant approval for its proposed 400-megawatt Ivanpah solar power plant installations. - The BrightSource project could be the first large-scale solar plant on BLM property. - BrightSource expected approval this month. - There is speculation no decision will come before early 2010 which would put in serious jeopardy Brightsource’s ability to meet power purchase agreements with PG&E to provide electricity in in mid-2011. - Ausra opened a 5-megawatt facility last week, the first solar power plant to go online in California in 2 decades. - The BrightSource solar power plant project is planned for a site near the Mojave Desert National Preserve along the California-Nevada state line. - Solar power plant builders want to develop a 2,600+ square kilometer stretch of federal land, an area bigger than the Hawaiian island of Maui. - Ausra is building a 177-megawatt plant in San Luis Obispo County. - PG&E is California’s biggest utility. - The BrightSource Energy project has been described as a potential breakthrough in U.S. utility-scale solar power plant development. Of the dozens proposed for the region, it is being closely watched as an indicator. - The BrightSource Energy project would be 3 installations on ~15 square kilometers of federal, BLM-managed land. - The $2 billion BrightSource installations would use a solar power tower concept in which a field of mirrors concentrate the sun’s heat at the top of a central tower where a liquid is heated to very high temperatures and flows to a power plant where the heat boils water to make steam that drives a turbine that generates electricity. - In the Brightsource plan, the installations would have ~200,000 7-square-meter mirrors. - Rob Morgan, executive vice president, Ausra: "We feel that the best way to meet our customers' needs in a timely, reliable manner is to initially build on private land…We can address permitting and environmental impact issues more swiftly and cost-effectively on private land." Research shows the most effective political lies are those promising people what they want. It presumably follows that if a politician can't tell people what they want to hear, he would avoid saying anything. McMansions and freeway commuting are not habits cultivated exclusively by residents of the megalopolises on the blue coasts. The rising cost of heating and cooling and lighting and commuting is being felt in the November 4 "swing" state of Ohio and even in the Greater Cincinnati/Northern Kentucky region. Len Ellis, manufacturing engineer, on his daily 42-mile 1-way commute from Sparta, Ky., to Cincinnati: "I love it here and would never move, but I did start rethinking that commute this summer when the prices went up…when the prices go from $3.70 a gallon to $4.89 in a month like they did this summer, that's big…"
Duke Energy, the region’s biggest utility, has requested permission from regulators to raise power rates 6% over the next 3 years. Keith Trent, group executive/chief strategy, policy and regulatory officer, Duke: "Here's the reality: Energy prices are most definitely going up…"
How does this impact the election? While some states, like California, have shifted a significant and growing portion of their power generation to New Energy and a bigger portion of their power generation to natural gas, much of the middle part of the U.S., like the Greater Cincinnati region, still depends largely on coal. While commuters in many metro areas on the blue coasts can resort to widely-used public transportation, citizens in the heartland cities rely almost entirely on their cars – and trucks and SUVs. Result: Greater Cincinnati has the 3rd biggest emissions per capita of the top 100 U.S. metropolitan areas - and the numbers are worsening. The point: Both candidates have plans to cut emissions. Those plans, it is widely believed, will drive energy prices higher. That matters a LOT in the heartlands. The cap-and-trade system both candidates have promised will only enhance this impact. Severin Borenstein, professor of business and public policy, University of California at Berkeley and director, UC Energy Institute: "So far, neither candidate has been willing to say that this will not be cheap…And it will not be cheap." An October 4-to-8 poll of Cincinnati voters showed 49% believe their standard of living is worse than that of their parents. Robert K. Kaufmann, director, Boston University Center for Energy and Environmental Studies: "The fraction of income that U.S. consumers spent on energy hit 4 percent in the 1990s, but that percentage has nearly doubled…"
Which candidate will make voters believe he can turn all that around? Here’s the data: A September poll showed 55% of Ohio voters see New Energy investment as the most important priority for U.S. energy policy. Advantage Obama? 59% of Ohio voters approve of building more nuclear plants to generate power. Advantage McCain? The likelihood is that heartland voters, hurting right now, are not in the mood for promises that will take a long time to come true. Therefore, their votes will go to whichever candidate can convince them his plan (“all of the above/drill baby drill” vs. “New Energy for America/a green New Deal”) will have the most immediate impact. 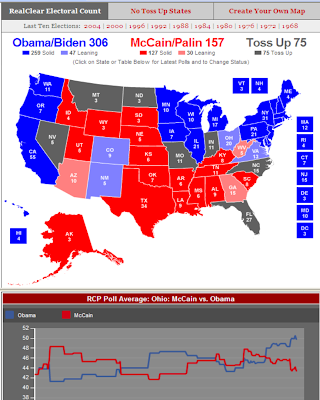 The most recent polls show Ohio tilting toward Obama and Kentucky hard for McCain. Severin Borenstein, professor of business and public policy, University of California at Berkeley and director, UC Energy Institute: "Energy is the only commodity in America where consumers will not ... absorb fluctuation, because the way we live demands that we have to buy gas and electricity…There have been plenty of politicians who have spoken the hard truth and you never even hear of them because that's not the way to get to Congress or to the presidency." How will the candidates’ energy policies will impact the U.S. heartlands? - Southwest Ohio/Northern Kentucky motorists paid 28% more for gasoline in 2008 than in 2007. So far, predictions have prices staying at 2008 levels in 2009. - 2000 to 2005: Greater Cincinnati per capita emissions worsened 12% while the nation’s worsened 2.2% and the 100 biggest cities worsened 1.1%. - Election day is November 4. - The article looks at the impacts of the candidates’ energy policies on the Greater Cincinnati/Northern Kentucky region. - Duke Energy is based in Charlotte, N.C.
- The Greater Cincinnati/Northern Kentucky region is among the nation's biggest energy-hogs. 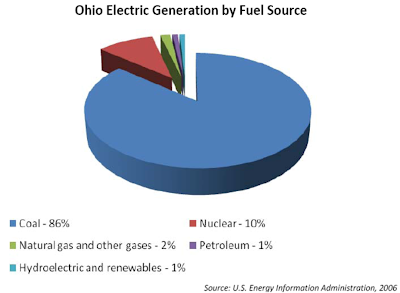 - Ohio gets 86% of its electricity from coal and less than 1% from non-hydro New Energy. 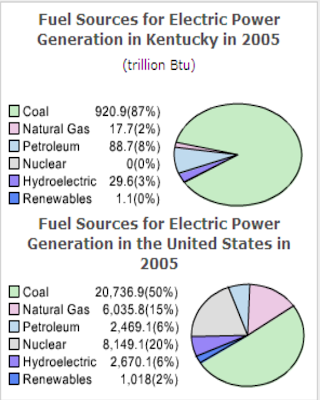 - Kentucky gets 87% of its electricity from coal and less than 1% from non-hydro New Energy. - Census data shows homes in the Greater Cincinnati/Northern Kentucky region are getting bigger and more expensive to heat and cool. - Robert K. Kaufmann, director, Boston University Center for Energy and Environmental Studies: "Consumers get squeezed, and it leaves less money to spend on everything else. And what happens then? ... All those individual decisions to spend less in the past have gotten us into recessions…"
- Severin Borenstein, professor of business and public policy, University of California at Berkeley and director, UC Energy Institute:"Politicians are not going to make any progress by saying that energy prices are going to be higher and that we just need to get used to it…"
The Swift Wind Turbine is what the wind industry calls “small” wind. It is designed for individual residential and commercial structures, not for large utility-scale wind farm installations. Small wind has become big business as people all over the U.S. and all over the world look for ways to make their own electricity. Small wind is one of the New Energy products Michigan Governor Jennifer Granholm risked her political legacy on when she campaigned her heart out to get the state to pass a Renewable Electricity Standard (RES) and transition to a New Energy economy. Granholm fervently believes making products like the Swift Wind Turbine is Michigan’s economic future. Governor Granholm: "It's all about jobs in the wake of a very challenging time in the auto sector…"
Even before the current financial crisis, Michigan’s once great auto industry and its Big 3 automakers were struggling. A move to New Energy offers the state a fresh start and, at the same time, an opportunity to do what it does best – manufacturing. Granholm pushed through an RES requiring the state’s utilities to obtain 10% of their power from New Energy sources – like wind power – by 2015. Michigan’s New Energy provision also includes “net metering,” allowing residents and small businesses to be remunerated for the energy they send to the grid from systems like the Swift Wind Turbine. 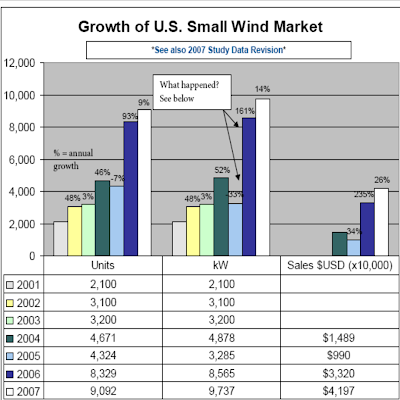 The recent extension of federal tax credits for small wind systems adds to the Swift’s value. These policy actions have given businesses like Cascade Engineering a needed boost. Cascade’s small turbine is aimed at the consumer market and designed for business and residential locations. Its parts are made from automotive plastics. It is engineered to be productive and efficient yet no louder than 35 decibels, the noise of a whisper. Jessica Lehti, marketing manager, Cascade Engineering: "We're allowing [homeowners] an on-site renewable solution for their home, whether in the city or [in the country]…[and helping businesses] offset those peak loads [of electricity demand], generate on-site renewable energy, and demonstrate their commitment…"
Governor Granholm has already demonstrated her commitment. Now its time for the people of her state to step up. Jennifer Granholm, Governor, Michigan; Cascade Engineering (Fred Keller, President and Michael Ford, renewable energy business unit head); Renewable Devices; Bauer Power Inc.
Granholm was in Muskegon to inaugurate the manufacturing plant for the Swift Wind Turbine, a small wind product to be made by a former auto industry manufacturer. - Cascade hopes to sell ~2,000 Swift units in 2009. - The first commerical installation of the Swift Turbine was earlier this year at Muskegon’s Frauenthal Center for the Performing Arts. - Cascade Engineering is based in Kentwood, Michigan, and has locations worldwide. - Renewable Devices is based in Edinburgh, Scotland. - The Frauenthal Center for the Performing Arts, the site of the 1st Swift Turbione installation is downtown Muskegon. - Bauer Power Inc. is based in Wayland, Michigan. 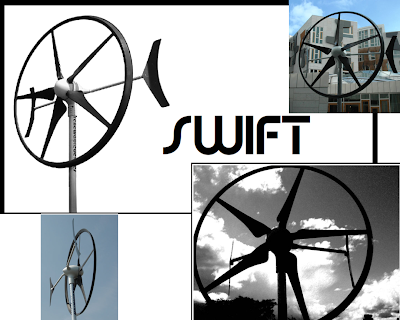 - The Swift Wind Turbine was developed by Cascade Engineering in conjunction with Renewable Devices. - Cascade redeveloped the Swift design developed in Scotland, changing the circular blades from carbon-fiber material to injection molded plastic parts. It made the turbine as quiet as “a whisper” and virtually eliminated bird kill issues. - The Swift Wind Turbine has a 1.5-kilowatt capacity and costs ~$10,000 (though with installation the cost varies) and should last 20 years. Residential units earn a $1,000 federal tax credit and commercial units earn $4,000. - It generates ~20% of the electricity for a typical 3,000-square-foot residential home (depending on wind). It requires a minimum 8 mph wind and functions in winds up to 40 mph. Its 8-foot diameter rotor easily affixed to most houses/businesses. - The Swift at the Frauenthal Center has a real-time, flat-panel display of its ongoing output. - Cascade Engineering is a traditional automotive plastics part company that employs 1,000 people. In anticipation of Governor Granholm’s New Energy economy, Cascade moved into non-automotive manufacturing sectors including waste disposal and alternative energy. - The Swift turbine operation employs 15. They assemble units in Michigan for sale worldwide. 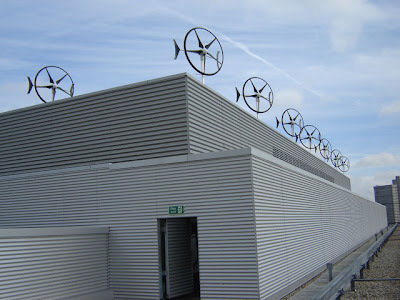 - Cascade is using a worldwide network of commercial installers to sell and set up the Swift turbine. Bauer Power is the designated rep for Western Michigan. - E-Net LLC/ EarthTronics, from the Grand Valley State University energy center in Muskegon, is also moving into home/ business small wind turbine manufacturing. - Governor Granholm: "This is the first celebration of a Michigan-made wind turbine being installed in Michigan…"
- Michael Ford, renewable energy business unit head, Cascade Engineering: "The growth of the Swift is unlimited as we scale it up and become more cost-effective…This is the future of Cascade Engineering and is a key pillar of our business going forward." Surely this is one of the most unqualified endorsements of the future of the emissions offsetting business so far made in the U.S.
With a run on its holdings that drained a third of its deposits just a week ago, Goldman Sachs has no cash to expend frivolously yet it bought a 10% share of Blue Source LLC, a dealer in one of the newest and most uncertain kinds of financial businesses, the selling of voluntary “carbon” offsets. Why would Goldman Sachs spend money on a company that deals in something so speculative as emissions credits? Because with the market down it can buy in cheap right now. For its money, Goldman Sachs gets a piece of a business expected to double in size when voluntary emissions credits become mandatory. That Goldman Sachs would expend limited liquidity on such an investment is yet another indication of how likely a mandatory cap-and-trade system is. The current meltdown may have delayed its arrival, but cap-and-trade is coming. The Emissions Trading Scheme (ETS), the European Union’s mandatory cap-and-trade system, has been in operation since 2005. There were problems early on but the market has stabilized in the last 24 months. The recent financial crisis has slowed activity and brought the price of emissions down but there is no indication the system cannot handle the turmoil. The Regional Greenhouse Gas Initiative (RGGI) involving New England states in a mandatory cap-and-trade system kicked off in September. The Western Climate Initiative (WCI) is making its way through state legislatures. Proposals for a national cap-and-trade system are scheduled for consideration by the next U.S. Congress. Both presidential candidates have endorsed the concept of a national system as the most effective way to put the power of the markets to work to price emissions and fight global climate change. Even if the current financial turmoil leaves political leaders in doubt about the wisdom of adding an extra cost into the economy right now, it is widely thought to be only a matter of time until such a program is instituted. Goldman Sachs apparently either believes the implementation of a mandatory emissions-capping system will not be delayed or believes the price of companies like Blue Source will rise soon in anticipation of that eventuality. 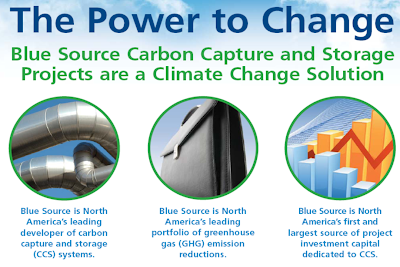 Footnote: Blue Source lists carbon-capture-and-sequestration (CCS) as one of its offset projects. This is instructive. Any cap-and-trade system must NOT allow credits for "clean" coal unless it can be proven clean (which is unlikely to happen in the foreseeable future). Goldman Sachs expended precious capital on the purchase of a piece of Blue Source, a company that deals in emissions-offsets. - The WCI launched in February 2007 and is making its way through state and provincial legislatures. - A national cap-and-trade system is expected to come before the U.S. Congress soon after the next administration is open for business - but whether it will be viable in the current economy is debatable. 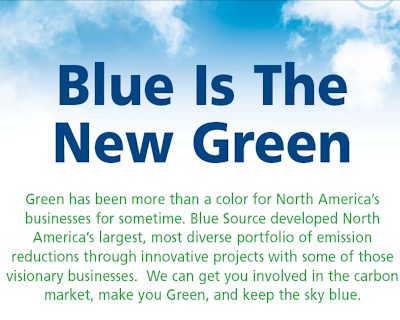 - Blue Source LLC is based in Salt Lake City, Utah. - The RGGI participants: Connecticut, Delaware, Maine, Maryland, Massachusetts, New Hampshire, New Jersey, New York, Rhode Island, Vermont. - The WCI participants: Arizona, British Columbia, California, Manitoba, Montana, New Mexico, Ontario, Oregon, Quebec, Utah, Washington. - Goldman bought an equity stake in Blue Source of less than 10%. - The partnership brings Goldman's liquidity and a customer list of thousands to Blue Source. 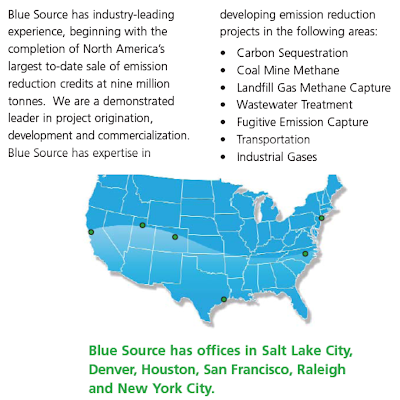 - Blue Source presently handles credits offsetting ~20 million tons of emissions annually. Demand is expected to double as mandatory emissions limits become more likely. - Voluntary emissions credits are purchased by companies that take it as their responsibility to offset emissions, and especially by companies that want to have the public image of a “green” or “socially responsible” company. - Credits from projects that destroy methane from landfills or that bury carbon dioxide underground are worth about $10 a ton, less than half the cost of credits in the European Union greenhouse-gas market. A forthcoming issue of Forbes Magazine will feature Energy + Genius, a series of short essays from innovative thinkers with solutions for the emerging energy challenge. Two of the essays come from Saul Griffith and Amory Lovins, scientists who stress the urgency of improving conservation practices and the efficiency of developing massive New Energy capacity. He isn’t especially encouraging about the potential of other (though preferable) New Energy choices: “You could get maybe three terawatts from all the addressable tidal power in the world…Building 100 square meters of solar panels every second for the next 25 years will get you two of the 10 terawatts…You'll need 50 square feet of solar thermal and a full wind turbine every five minutes..."
Here's Saul Griffith. From OreillyMedia via YouTube. He describes a comprehensive, workable solution that reaches across a set of potentially conflicting points of view to justify a unified, effective effort. Lovins coined the term "institutional acupuncture" to describe the use of conservation and efficiency to identify and clear the points of congestion in businesses and create revolutionary breakthroughs to stimulate and drive the economy. Here's Amory Lovins. From ed4wb via YouTube. Build a new nuclear plant every week? I don't think so. Radical efficiency can decouple us from oil for far less than making more. The forthcoming Energy + Genius from Forbes Magazine will present innovative answers to the world’s energy challenge from prominent players in the field. Saul Griffith and Amory Lovins, 2 of the most distinguished contributors because they are scientists, talk about the value of increased efficiency and conservation and the urgent need for the development of New Energy. - The magazine’s special feature will be published November 5 in anticipation of the November 11-12 Forbes Energy Conference. - The Forbes Energy Conference will be in New York. - The special issue will be available on newsstands and can be read on line. The new yardstick: 1 trillion electric-vehicle miles per year within a decade. It won't cost much and could save the nation hundreds of billions of dollars. Texas' governor opts for an ''all of the above'' energy policy. Montana's governor says storage is what's keeping us back. General Motors' chief executive says breakthroughs could come surprisingly soon. - Lovins: My book Winning the Oil Endgame has a road map for eliminating U.S. oil use, led by for-profit businesses, at an average cost of $15 per barrel (in year-2000 dollars): half by redoubling efficiency, half by substituting saved natural gas and advanced biofuels. A 5-megawatt solar power plant went online in California October 23. It’s a small addition to the California electricity supply but a giant step for solar energy. The California Energy Commission (CEC) is studying proposals for 5 large solar power plants with a combined 1,512 megawatts capacity. The U.S. Bureau of Land Management (BLM) has received permit requests from developers for 34 more solar plants in the Southern California deserts with a total potential output of ~24,000 megawatts. All of this signals a coming return to stardom for the solar power plant concept that was created in the California deserts 2 decades ago in response to skyrocketing fuel costs in the 70s but abandoned when the price of natural gas-fired electricity generation turned cheap. Today's solar power plants have advantages over the previous incarnation that could protect them as natural gas prices once again plummet. One is California's strict requirement that its utilities obtain 20% of their power from New Energy sources by 2010. That makes utility-scale solar generation appealing. Another advantage is how fast utility-scale solar generation can be built. The cost of new solar power plants beats the cost of new plants using fossil fuel sources when the quicker return on investment and the high cost of financing are figured into the equation. Solar power plants come in a variety of competing technologies. The new Ausra installation north of Bakersfield that just kicked off ceremoniously uses fields of mirrors to capture the sun’s heat and reflect it onto water flowing in a tube above the mirrors to create steam that drives a turbine to generate electricity. California Governor Arnold Schwarzenegger, at the power plant inauguration: "This next-generation solar power plant is further evidence that reliable, renewable and pollution-free technology is here to stay, and it will lead to more California homes and businesses powered by sunshine…"
Ausra will apply this technology in a 177-megawatt solar power plant installation in 2009. Competing solar power plant technologies include a field of mirrors that focus the sun’s heat at the top of a central tower where a liquid is heated and flows to a central power plant to generate electricity in the same way as the trough technology does. A third concept utilizes individual modules. Each of the 3 concepts has variations on the basic theme. Each offers the potential for storage of steam for power generation when the sun is not shining. 5 or 10 years from now, people will look back on this inaugural ceremony as the launching of a new era in solar energy and the beginning of a race between the technologies. The competition for dominance in the field will be one of the most interesting in the business world in the coming decade. Everyone will agree: The remake is better than the original. The ceremonial inauguration of a 5-megawatt solar power plant built by Ausra and funded by a PG&E power purchase agreement kicks off a new era in solar energy and a new race for technological dominance in the field. A closer look at Ausra's technology. From alternativeenergycom via YouTube. - 1990: This is the first new solar power plant to go into operation in California in 18 years. - 2009: The installation will expand from 5 megawatts to 177 megawatts next year. - 2010: California’s RES requires its utilities to obtain 20% of their power from New Energy sources by December 31, 2010. - Ausra is based in Palo Alto, CA. - The new plant is on the northern outskirts of Bakersfield, CA. - Next year’s 177-megawatt installation will be on the Carrizo Plain in San Luis Obispo County. -Brightsource Energy, using a different solar power plant technology, is developing hundreds of megawatts in the Mojave Desert. - Ausra built its 5-megawatt Bakersfield plant as a demonstration project. - The power purchase agreement (PPA) with PG&E is a key funding element in Ausra’s ability to move forward. PG&E also has a PPA for the electricity generated at Ausra's Carrizo Plain solar power plant to be built next year. - The Ausra trough technology is the oldest and most proven of the technologies being developed. -Brightsource Energy, whose principals helped develop the original trough technology, now uses solar power tower technology. - Both the Ausra and Brightsource Energy concepts allow for storage capability. A different kind of solar power plant technology from Brightsource Energy. From 5293565 via YouTube. - Bob Fishman, CEO, Ausra: "The primary reason we built this facility was to demonstrate to our customers and our investors that we could do what we said we could do…"
Given the immensity of the need for New Energy, it is surprising to hear a federal official admit the federal agency in charge of moving the process along is, instead, impeding it. Stephen Allred, assistant secretary, U.S. Department of the Interior (Interior): "We have to do better with the federal government to give access to them, to speed up the time frame, and to get transmission (lines) to them…"
It is all noble and so on of Secretary Allred to acknowledge Interior’s bureaucratic failures but does anybody over there know the numbers described by scientists about the amount of New Energy the U.S. needs to build in the coming quarter century? And Interior is slowing the process down with bureaucratic snafus? And they admit it? Footnote: Many have long believed the Bush administration agencies have been foot dragging to allow Old Energy to get as much production infrastructure as possible established before a new administration unleashes the forces of New Energy. The Dry Lake Wind Project signed deals with BLM and State Land and is on track to begin construction by 2009 and begin generating electricity the following year. - BLM received the application in summer 2007 and has just now readied it for signatures and authorization. - 2010: First phase of Dry Lake scheduled to open. - Proposed: A second phase would be 6 or 7 times as big. 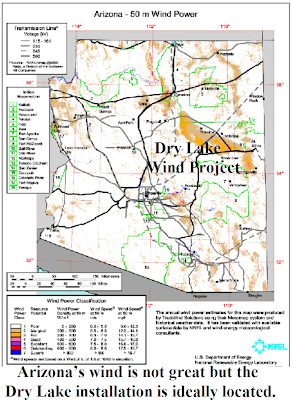 - Dry Lake is northwest of Snowflake, Ariz.
- Dry Lake will be Arizona’s first operational wind project. 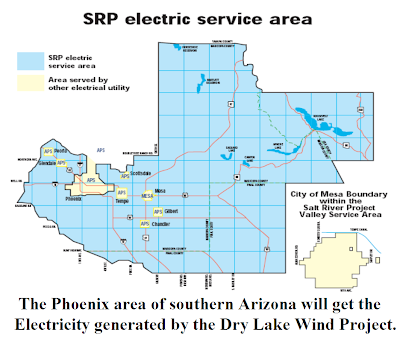 - Salt River Project, a major Arizona utility, will purchase the electricity generated at the Dry Lake installation for its Phoenix-area customers. - Iberdrola is based in Madrid. - A power purchase agreement (PPA) with Salt River Project facilitated the Dry lake installation’s financing. - BLM will earn $36,966 in leases on the project in 2009 and hopes to derive $87,255/year when the installation is in service. - State Land’s deal with Iberdrola is based on the electricity generated. It could earn $4 million during the 50-year agreement. - Iberdrola also has a private land lease agreement with Rocking Chair Ranch. - The ranch’s cattle operation on public and private land in the area won't be affected by the development. - The first phase of the Dry Lake Wind Project will be ~30 turbines with a 63-megawatt capacity. - A proposed second phase could have as many as 200 or more turbines and a 314-megawatt capacity. Stephen Allred, assistant secretary, Interior: "[The Dry Lake Wind Project is a] totally positive approach to meeting our energy needs in the U.S."
OLD ENERGY VS. NEW ENERGY IN W. VA.
Massey Energy wants to turn Coal River Mountain into another mountaintop removal mining site. Mountaintop removal mining is considered the fastest, most cost-effective way to mine coal reserves. The name explains the mining technique: Mountaintop removal. Forests are clear-cut, seams are blasted and massive diggers scoop out the mountain’s coal. Rock and dirt are dumped into “valley fills” below. The local citizens and activists of Coal River Mountain Watch want Massey Energy to return to tunnel mining and use the mountaintop for a wind installation. 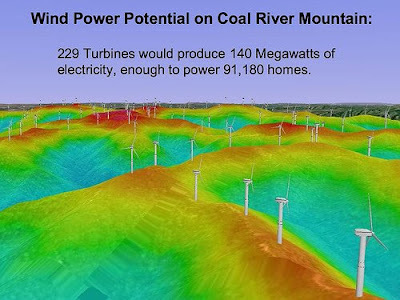 Coal River Mountain has winds that range from Class 4 (15.7 mph ), the miniumum for an effective installation, to Class 7 (19.7+ mph). Those winds assure a very productive installation. West Virginia earns $300 million a year in coal severance taxes, revenues officials say the state needs. Lorelei Scarbro, widow of a coal miner who died of black lung and owner of land at Rock Creek threatened by the Massey project, on the state's need for the revenue: "So do hookers and so do pimps…That doesn't make it OK. ... It's not OK for us to be sacrificed so the rest of the world can have more energy." Coal River Mountain has become a central front in the international war against coal. Coal River Mountain Watch is supported by the Sierra Club, the Rainforest Action Network, the National Resources Defense Council and other environmental groups. Some celebrities have joined the cause. 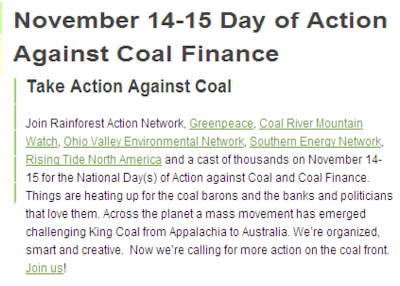 Friends of Coal, a coal industry group, has responded. Chris Hamilton, senior vice president, the Coal Association: "The fact is that we have a small band of environmental extremists who just want to shut down mining in West Virginia…It's hard to tell if this is a proposal aimed at slowing down mining or restricting mining in that area, or if it's a bona fide proposal to build windmills." Some locals know of no opportunities other than coal, know nothing of wind as an energy source and do not have the resources to concern themselves with global climate change. Eric Bragg, 29-year-old miner, a hard-hatted skull and shovel/pickax crossbones tattoo on his left biceps: "It's just trying to put people out of jobs…"
John Sprouse, 21-year-old West Virginian, on being told about wind energy: "That's kind of funny. I never heard that before…"
Joyce Gunnoe, general store keeper, Dry Creek: "[Coal River Mountain Watch doesn’t] have a dog in this fight…We work here. We live here. We were born and raised here…Coal hasn't hurt us. Coal's helped us." Bob Wills, farmer and father of a son who left West Virginia to get work outside coal: "Our politicians have never seen fit to diversify…If they do away with the mining, then I don't know what people are going to do…It's a necessary evil, I guess." More than half of Appalachian coal mining is done by the wrenching mountaintop removal method. Curtis Moore, Good Samaritan Ministry, Whitesville: "Just remove your skyscrapers. Take it down to ground zero and then see what your city looks like…They'd be devastated. And that's what it is here with the mountains." Lloyd Brown, retired miner, Whitesville: "There's a right way and a wrong way to mine coal. Massey's come in here, and he (Blankenship) has raped the southern part of West Virginia just to get the coal…They're taking away the beauty of West Virginia…This is part of the beauty, our mountains. They say they put them back better than they were. I don't see that." 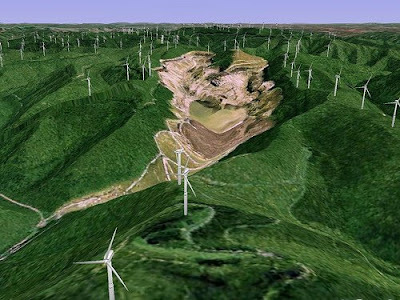 Massey Energy says the wind installation can be built after the mountaintop is destroyed and restored but restored land is lower and too unstable to support wind turbines. It can be used for little other that commercial development. Coal River Mountain Watch is fighting Massey Energy in the courts and in the court of public opinion. It expects no quarter from the coal company. Locals, used to the power of the coal industry, are not hopeful. C.C. Ballard, 39-year veteran, Peabody and Patriot coal mines: "They're not going to get it stopped. There's no way…They're going to come in here, they're going to take everything that West Virginia's got. We're gonna be left with a big hole in the ground and nothing to show for it." The most hopeful remark is from a railroad employee who not only sees the coal being mined and transported but sees it being consumed. In this larger awareness, a vision of tomorrow glimmers. Charles Cowley, railroad conductor, coal-hauling trains: "If they don't do something with wind and water…we're all going to be with the lights out." Coal v, Wind: Energy fight rages in W.Va.
Coal River Mountain Watch continues to fight Massey Energy over the fate of Coal River Mountain. Massey wants to do mountaintop removal coal mining (mtrcm). The citizens and activists want Massey to tunnel for the coal and build a wind installation atop the mountain. All about the Coal River Mountain projects. From iLoveMountainsorg via YouTube. - 300 million years ago: Formation of West Virginia coal deposits. - mid-1700s: Coal mining began in the region. - Since 1836: 13+ billion tons dug from West Virginia. - 2022: Coal River Mountain’s coal reserves should last 14 years. - 2033: A wind turbine has a life span of at least 25 years. - 235 years: Larry Gibson’s family has owned land in the region for almost 2 ½ centuries. - West Virginia is presently the U.S.’ 2nd biggest coal producing state. Wyoming is first. - Estimates put U.S. coal reserves underground at ~52 billion tons. - The spot-market price of steam coal is $133/ton and is likely to rise. - The wind installation would have 200 turbines. - West Virginia has ~600 working coal mines. 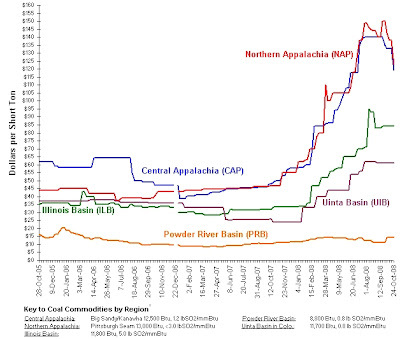 - 14-to-15% of U.S. coal mining comes from mtrcm methods but in Appalachia it is more than half. - EPA: 400,000 acres of forest wiped out, ~724 miles of streams buried (1985 to 2001) by mtrcm. - A West Virginia lawsuit before the 4th U.S. Circuit Court of Appeals argues, backed by a 2007 U.S. District Court ruling, that the Army Corps of Engineers failed to fully consider the environmental damage of permits issued to Massey subsidiaries. - West Virginia Governor Joe Manchin has declined to intervene. - Larry Gibson, landowner, Kayford Mountain: "This land right here has done as much for the people as their own mother did…My mother give me birth, but this land give me life…I wouldn't put a lump of coal in this daggone place if I was freezin' to death tomorrow…Coal's something we used in primitive times... We can surely do better." - Don Blankenship, CEO, Massey Energy: "Most coal mined by surface mining cannot be deep mined…Energy resources would be lost if not surface mined…Our company is an energy company," he added. "We produce mostly coal, but also natural gas. If wind farms proved to be economical, we would invest in them. We are studying that possibility, but the answer is not yet clear in West Virginia." - West Virginia Governor Joe Manchin: "If we can't do it in a more productive manner, it shouldn't be done, I understand that…And we're looking at that, and I think there are better ways. But just to say we're going to shut it down? We cannot afford in the United States of America to discount any part of our energy portfolio."